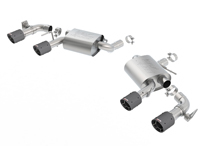 This system is for vehicles equipped with dual tips and NPP (dual mode exhaust). It features unique Borla® carbon fiber tips. The ATAK system is our most aggressive sounding system.